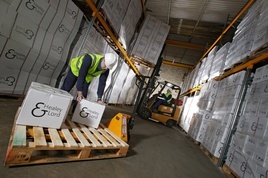 Sanitary ware designer Healey & Lord has consolidated its warehousing and invested in state-of-the-art' Stakapal racking systems to boost supply chain effiencies. Having secured a good reputation for their quality products, value for money and swift deliveries, stockist demand has increased significantly in the last year. The new warehouse will help to ensure that service levels are maintained. "We were operating out of 2 warehouse locations" says Healey & Lord Director Richard Gates. "Now we have consolidated that and have created tremendous pallet space capacity under one roof. The upgrade means the process of bringing in containers of product and storing it; through to the dispatch of our individual customer orders will become more fluid whilst enabling us to meet growing demand efficiently."